In practice the providing of information security for personal computer (PC) users is a set of problems, closely associated with the usage of program-technical facilities intended for different purposes. The matter is that in different institutions the most widespread feature of the PC exploitation is the public-staff access not limited by the authorities. It inevitably results in situation when a single PC is accessible for out-of-control number of users. Such multiuser exploitation mode generates sooner or later the necessity of protection of the data stored as well as direct users’ data. - PC connection to the local or corporate network with its simultaneous Internet connection. The partial solution of this problem can be realized due to the user’s individual information storage, such as flash cards, removable hard disks etc. However, in fact it does not solve the problem of an unauthorized access by another persons, malefactors or harmful software during connecting of the individual storage to the PC. Besides, it should be noticed that it is not unsafely to entrust the significant information to these devices. First of all, there is a risk of information loss (physical or mechanical) especially if there is some confidential information of great significance written on it, so the consequences of such loss can appear to be the most sorrowful. In this connection, a task of providing the reliable users’ data protection is actual as never before. 3. Access restriction to the files/folders. It should be noticed that the methods of information protection mentioned above have some drawbacks. The presence of the hidden partitions is easily determined by comparing the actual and real capacity of storage device. - probability of partial information loss in the process of archive creating, this probability especially increases when using the flash (because of exceeding the number of recording-reading cycles granted by a producer) . An access restriction to the files/folders is carried out as a rule by means of additional software: Folder Crypto Password; Secure Folder; Hide Folder; Lock Folder etc. by means of built-in facilities of the operating system (OS). In this case, access to the protected information is limited by the administrative facilities of OS, that is unreliable of itself. In connection with stated above, it should be concluded that for reliable users’ information protection the only remaining choice is to use some cryptoprotection in real-time mode. It will allow to realize the continuous work of encryption/decryption traffic algorithm from PC to the removable storage device in the process of recording/reading . For a proper task solution to be made, the TrueCrypt – free, crossplatform cryptographic software with open source code for on-the-fly encryption – is the ideal option in practice. On-the-fly encryption (OTFE) represents a method used by some disk encryption software and refers to the fact that data is automatically encrypted or decrypted as it is loaded or saved. The entire file system within the volume is encrypted including file names, folder names, file contents, and other meta-data . - variations of plausible deniability, including impossibility to define the presence of TrueCrypt volumes – they are just a set of occasional data. Their identification is unlikely to be possible by means of TrueCrypt (not counting the method of termorectum cryptoanalysis). - possibility to use TrueCrypt on the PC with a real user’s rights. 1. Removable storage device (external HDD or flash card) is to be divided into two partition . The size of the first partition is determined by TrueCrypt size and makes 2-5 Mb. 2. Copy a TrueCrypt portable variant into the first partition. 3. Start TrueCrypt and implement the encryption of the second partition. 4. Mount the encrypted partition onto a Disk. 5. Perform the information transfer onto a Disk. 6. Unmount Disk into the encrypted partition. 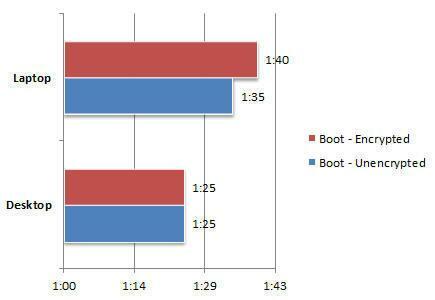 The figures 2-4 represent the experimental research results of the problem formulated as follows: How does encryption with TrueCrypt impact the PC performance for both Desktop and Laptop (red – encrypted mode, blue – unencrypted mode) . As it can be observed from the diagrams presented on Fig. 2-3, the productivity of PC video adapter does not go down but at OS boot time it even increases for Laptop with the use of SDD. The observation of the diagram (Fig. 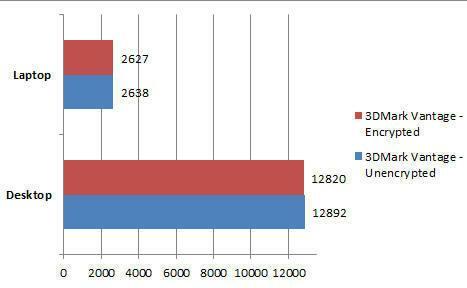 4) shows decrease in performance of Laptop of SSD version (- 15%). 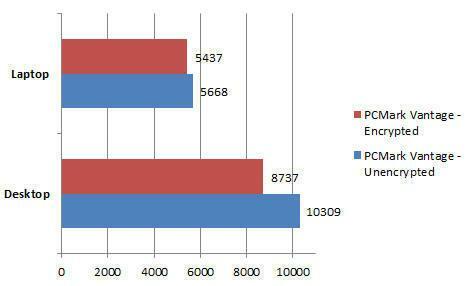 At the same time the initial velocity of solid-state drive is so high, that they anyway win from the PC with HDD, which lose only 4% in performance. The comparative testing conducted on PC of the next configurations: (Laptop) - AMD Phenom II X4 905 (2.5 GHz), 6GB DDR3 1600 MHz, Radeon HD6870 OC 1GB DDR5, 120GB RunCore Pro V 2.5" SATA III SSD; Stationary PC - Intel Core2 Quad CPU Q9000 @ 2.00 GHz, 6 GB of RAM DDR2, ATI Mobility Radeon HD 4650, Seagate Momentus XT 500GB HDD. Presently the TrueCrypt has got the further development in separate trends – CipherShed  and VeraCrypt , which are fully noteworthy. Started in June, 2013 this software is successfully developing and supported. Moreover, some errors of its predecessor are eliminated in it . The TrueCrypt original codebase is taken as above mentioned software basis. It should be also noted that the formats of VeraCrypt cryptocontainers are incompatible with TrueCrypt. On the contrary, CipherShed cryptocontainers are compatible with TrueCrypt. TrueCrypt independent audit conducted by iSEC Partners company showed in total 11 threats to users’ information security in its code. 4 of which have a middle level of threat, other 4 – a low level, the others are difficult to classify in principle through their insignificance. More detailed results of audit were published in a document, placed on the internet resource www.opencryptoaudit.org [10, 11]. In summary, the application of cryptographic software discussed above is the most effective decision, which allows to prevent the leak of users’ confidential data placed on PC and external storage devices. The personal 10-year experience in TrueCrypt exploitation allows this article authors to confirm blamelessness, reliability and stability in operation of the software presented. Download TrueCrypt software. Authors publication: Informatics and Mathematical Methods in Simulation.Vol. 5 (2015), No. 4, pp. 347-352.